Better late than never. 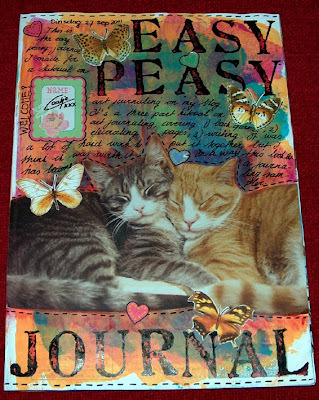 Here is part three of my Easy Peasy Journaling Tutorial. It's another lengthy one! I have tried to be extensive in my writing about writing, but If anything is not clear or if you have any questions, please let me know in the comment section so others can profit from it too. I would also like to thank all of you who have commented on the other two parts of this tutorial. Believe me, if only one of you gets something out of it, it will be worth my time. Hope you enjoy this last installment! It seems that when I post my journal pages the one thing people are most intrigued by is the writing. There's so much of it and it seems so neat and straight (I dare you to put a ruler to my pages however and you'll see I'm not so perfect after all, haha). How do I do it? Whatever do I write about? Where do all those words come from? My life can't possibly be that interesting, can it? 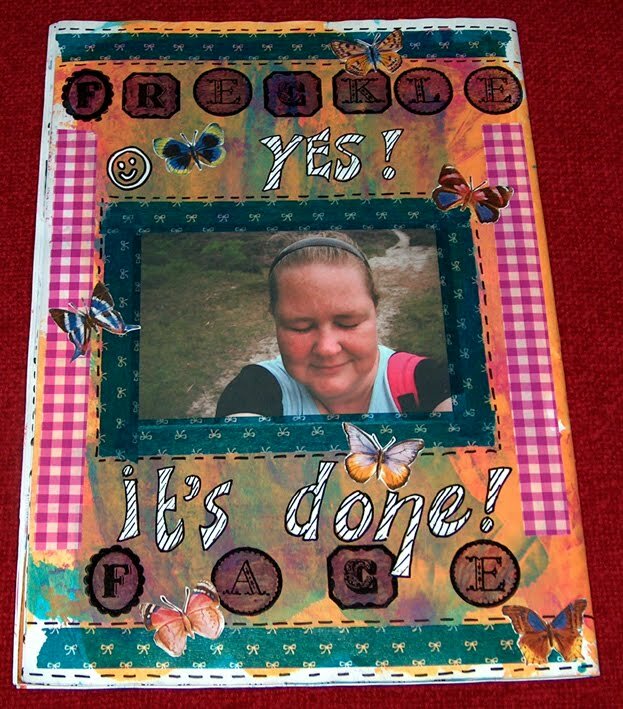 This is how the Easy Peasy Journal front cover looks all finished. I added some writing in longhand and my signature. I don't usually write on my covers, but I had left some space empty, so why not? 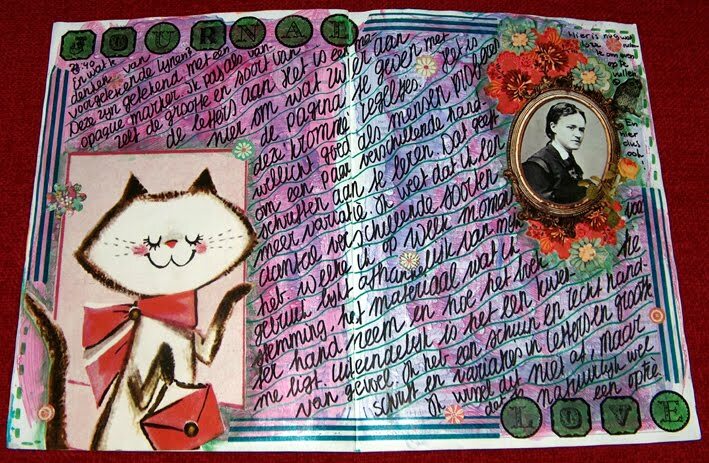 I'm pretty happy with how this journal turned out, although I believe it's become more of a journal sampler than an actual journal, but I suppose that is to be expected if you use a journal to illustrate things you want to show for a tutorial. Writing by hand is quickly becoming one of those mysterious acts of the past, a lost art. I notice it when I sit in a public place and write. People are amazed and curious, they stare at me and some even comment on my handwriting. Really people, I'm not fishing for compliments, nor am I trying to be modest when I say: my handwriting is nothing special. I work in an office where people have to file for local taxes once a year and around that time I see a lot of handwritten filled in forms and you would be surprised how much more beautiful most people write and also...every personal handwriting is unique and special. I think the point really is that hardly anybody does it anymore, writing by hand I mean. So when you do, that already sets you apart from the masses and makes you look special. Keep that in mind: if you write by hand you're already doing something special, no matter what you write about or how your handwriting looks. Isn't that a great way to start this tutorial? Just like with all the other aspects of journaling: journal writing is something you cannot fail at, there is no right or wrong way to do it. Just as long as you do it! Still, if you never write you may be completely mystified by it and I hope to give you some ideas for writing today. This tutorial will be about the two aspects of journal writing. One is content and the other is form. I have decided to do it in the following way: I will do a lot of writing on the content of writing (what to write about) and I will illustrate the form (how to write it all down) with examples from the Easy Peasy Journal. I will also give some resources at the end of this post. Let's go! This is basically how I journal about 99% of the time. I just write long straight sentences in my preferred handwriting. Sometimes I will write longhand, depending on my mood or my position to the paper. That it looks pretty straight and neat is not the result of any trick, but just of practice. I have written for years and years and at some point left behind the ruled books for blank pages. In the beginning my writing was much more all over the place, but somehow I have learned to write in a more consistent way. If you don't write that way naturally don't fret. Just write how your write. Don't try to emulate someone elses handwriting, try developing your own. You can only do this by writing. A lot! If writing in straight lines is very important to you for some reason, you can always put down lines with a pencil and a ruler and erase them later. But don't feel you have to do this. Keep your own style, it's usually the better choice. You might like to have some different types of pens for colour effects or different lines. I find that ballpoint pens will write on just about anything. Experiment with markers, gel pens, felt tip pens, paint markers, pencils, etc. etc. Some backgrounds, especially when very structured and layered can ruin some pens. In that case try pens with a brush tip, they work like a charm and don't get destroyed by too many rough effects on the page. As with the other instalments of this tutorial, you will have to try and find out what works best for you. There's no one pen that fits all situations. It can be very interesting to consciously not go for straight lines, but choose for diagonal or wavy ones instead. On this spread I used a marker to draw wavy lines diagonally across the pages. After that I filled those line with writing. In this case I filled up the entire space between the lines, but you can vary the size of your handwriting. It can however give an interesting effect to try to oversize your lettering by filling the space between the lines. You can use a different color for the lines and the writing, but you can also use the same color. You could also do these lines in pencil and erase them after you're done with your writing. Experiment and see what you like best. What stops people from writing is not that they have no thoughts or ideas, it's that they censor them before they go to the page! They think they are not page worthy. This is a big mistake in thinking. It's thinking of journal writing as something that will be read. But journal writing is not about reading, it's about getting it (whatever it is) out of your system. It's writing for writing's sake. It's the act in itself that matters. It's expression. You're clearing your head by putting your thoughts down. That's all. 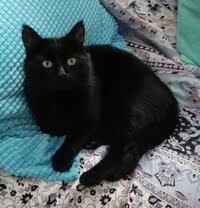 You're not writing a novel here. You're not trying to win a Pulitzer or a Booker Prize. 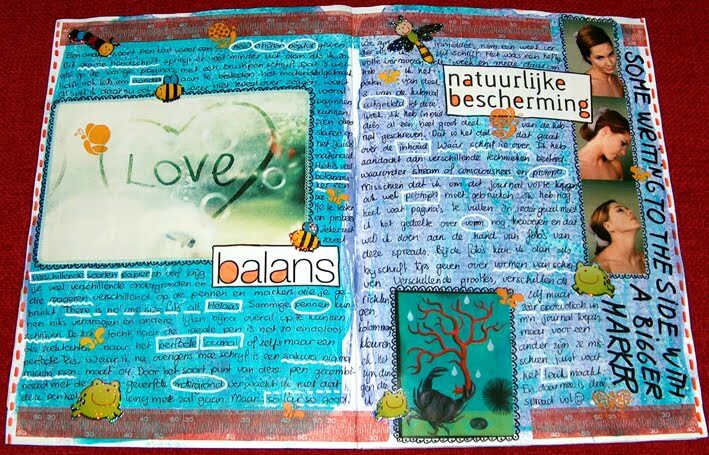 Don't look at your journal as some kind of sacred spot where only the most profound and deep feelings have a place. Look at is as a dumping ground for everything that's in your head. Spelling, style, grammar and all that stuff have no importance in the journal. You're not looking to publish, you're looking to get it out of your system. Journaling is ultimately an instrument, a tool, it's not a purpose or goal. The point is to sit with your thoughts and get them out in whatever way they present themselves. If anything else, consider this: how can you ever get to the profound thoughts and feelings if you don't clear away all the crap that's in front of them? 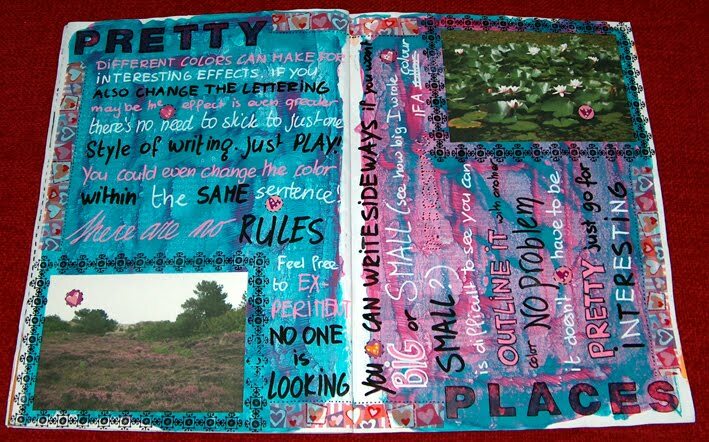 On this spread I used my normal everyday writing in my normal every day straight lines. But after I was done I took a different color pen/marker to outline and underline specific words. This can give a nice visual effect. For a more muted look you can do this with the same pen you were writing with. You can put circles or squares around words, underline them with straight or wavy lines or use dashed lines. Try to doodle a little around your words and see how that makes the text look. Some accents can really liven up an otherwise bland text. On the side of the spread there was some space left that I filled up with some bigger lettering in a bigger marker. Don't forget you can write in any direction you want! If writing down your thoughts the way they come to you seems scary or just impossible, you might like to try getting out of your head instead. How about looking around you? When you sit down to write, you are probably in some place that's familiar to you, but have you ever really looked at it? What does your table look like, or your pen, or how does the chair feel that you are sitting on? What color is the wall in the room, what patterns present themselves? Look around you and tell your journal what you see. You don't have to write how you feel about it, although you might get to that eventually. Something you see can trigger all kinds of thoughts and feelings. You can choose to go with those thoughts, but you can also choose to ignore them and keep your writing observational. An example: when I use a new pen or other material or start a new journal I will often write about how it performs. How does the paper feel, the size of it, how does the ink look on the page, how does the pen move across it. Stuff like that. This kind of writing is especially nice if you are in a place like a museum or on vacation. What does it all look like, smell like, feel like, behave like? You are writing down clues for future reference, you are putting a memory on paper, how wonderful! The most ordinary thing can become interesting if you really take the time to observe it. You could try to seperate your senses when you do this. What do you see? What do you hear? What do you taste? What do you smell? What do you feel on your skin? Have you ever just sat for a few minutes, eyes closed, and listened to the sounds around you? Try it and write down what you hear. It may give you a whole new perspective on your surroundings. Try it in different locations too. Another cool thing about observations is that it gets the hand moving on the page. There's a reason that about 90% of my journal entries start with an observation about the weather. It's simply a place to start. The first words have found the page and I'm off! The page is no longer blank and scary. What you see can trigger emotions. Why not write about them? Now we come to another kind of observation: the internal kind. The one that answers the question "How do you feel?" My, you could just write pages and pages on that question alone, right? You can observe how you feel and you can even dig deeper and ask yourself why you feel that way. Maybe that will trigger memories or ideas you can also write about. I feel that writing is a lot like painting. You cannot be too concerned about the final outcome, because you don't know the final outcome. You just have to start with a color (or word or sentence) and see what happens and don't be afraid to try a different color (or word or sentence). Don't think too much beyond the layer you are working on. Just go with it and let it evolve. It doesn't have to make sense, really it doesn't. If you can't think of anything to write, you can always resort to the words of others. Try quotes from literature, poetry or (as in this case) songs. There's a world of beautiful lines out there ready to go into your journal. I wrote this quote from one of my favorite songs in big bold letters that I later decorated with a paint marker. Try drawing your own letters by first making a simple letter and then making parts of it fatter with a marker. You can easily decorate them by outlining them or putting dots or other marks on top with a contrasting marker. If you want to do more elaborate lettering check out the resource section at the end of this post. There are some very cool lettering books out there. You might also want to try a search on google or see others do lettering or calligraphy on youtube. If all else fails: use stamps! For some it is really hard to just write out of the blue without a specific thing to write about. They need a little (or big) nudge to get the juices flowing, because they are just stumped for ideas. I guess there are as many different kinds of writers as there are people. For you the gods of journal writing have invented questions and prompts! Yay! Think of prompts as specific subjects to think and write about. They can be elaborate and intense or very simple and straight forward. There are websites devoted to journaling prompts (check the resources below this post) and there are books with questions or prompts in them that you can use. 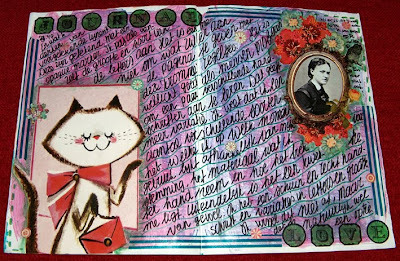 Someone like Kelly Kilmer has online classes where she both teaches her (wonderful) style of journaling and gives loads of journaling prompts to write with. I'm sure there's others out there who do this too. Another way to get prompts that I have used in the past is to read interviews with celebrities in magazines. See if you cannot answer some of the questions they are asked for yourself. Of course not all questions will apply to you, but a lot of them will or you can adapt them to your personal situation. Think of it as the big interview with yourself. It's fun! · Where do you live? How long have you lived there? What does your town look like? What do you or don't you like about it? Is this the place you want to stay forever? Why? Why not? · What do you do for a living? How did you come about doing this? Is it your dream job? Why or why not? And if not, what would your dream job look like? · What's your favorite color? Why? What does it remind you of? Do you surround yourself with this color? If yes, in what way? If not, why not? Do you ever wear it? Get the point? A question can lead to another question and another and another. There are so many interesting things to know about yourself and your surroundings. Why not write them down and enrich your knowledge of self or expand your horizon. I made this page to show you how different markers can affect the way your handwriting looks. Thicker tips make for thicker letters and this affects how you can write. Also try to experiment with your handwriting itself. Try longhand, try print letters, try capitals. How does it affect your message? Try writing in different directions on the same page. Try following the outline of part of an image. Everything has a different effect and it makes the writing fun. This is a very interesting technique if there's a specific problem you want to tackle. Talk to it! Huh? Yes, that's what I said: talk to it! Have a conversation on paper with a person, an object or an idea. It may seem silly, but it can really clarify things for you in a way you may never have considered. Maybe you have a distorted relationship with your body for instance. Why not start a dialogue with it and get to the bottom of things. By putting yourself in the position of the 'opposite party' you may gain a new perspective on the situation. If anything it will help you get out of the vicious circle of your one sided thoughts. What you do is that you put on paper both sides of the conversation. You write down what you say and then you answer through the 'mouth' of your problem/object/person. This is not about what they would say or think, it's about what you think they would say or think. Get the difference? It's all in your head! This is in a way a variation of the dialogue, except it is one sided. Write a letter to who or whatever you want to. This can be for a deep troublesome reason, to clarify your mind, to get out your anger at somebody, whatever. But it can also be a very light hearted exercise. How about writing a fan letter to a long gone movie star or a fictional character? Or it can be to stir memories. How about writing to a lost loved one? Or an old friend? Or how about writing a letter to yourself? The possibilities are endless! You could even use pretty stationary and clip the envelope to your journal pages. You could even mail a letter to yourself. We are getting close to the next possibility now, creative writing. Just remember, that whatever you write, the person you write to never has to read it, so you can be free to write whatever you want. Keep in mind that nobody has a right to read what your are writing, your journal is for you alone. As I said above, it's all about the writing, not about the reading. 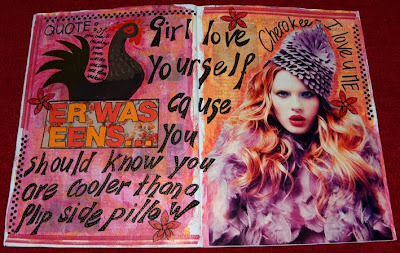 In fact, keep in mind that a journal is personal. It's not a scrap book, it's not a show album. It's for you and it's to be used as an instrument for self exploration. Nobody else has any business reading it. This does not mean that you should not let anybody read it if that's what you want, but who reads it is up to you, not to them. 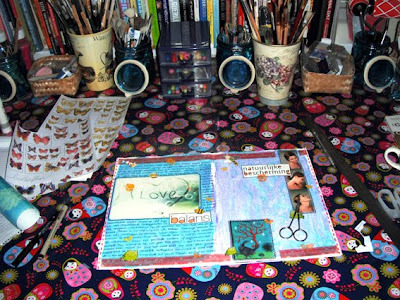 As you can tell I show most of my journal pages, because there is not much on them that I wouldn't say out loud too, but there are some pages I will not show, some writing I will not share. My thoughts are my own. If a loved one thinks he or she is entitled to read your journal ask them to think how they would like it if everybody could read their mind 24/7. That's what a journal should be, a mind uncensored. A free and safe zone. Who you share that zone with is completely your choice. Next to writing in different forms of letters, try writing with different color markers or pens. Combine different styles with different colors and see how it affects your pages. If a certain type of color is not very visible on the page (as is the case with the pink marker on the right hand page) you can always outline it with a contrasting color to make it visible again. 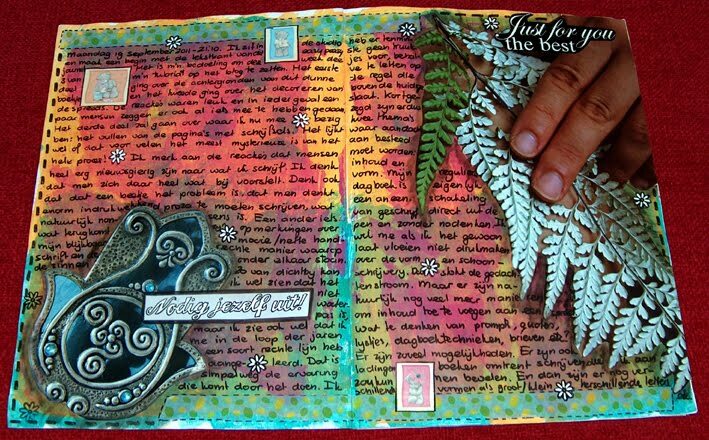 See your journal not only as a place to express your thoughts, but as a place to play with visual effects. 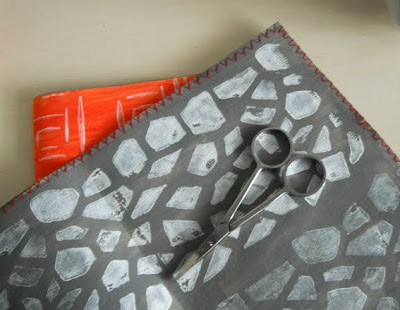 Experiment with the materials you have at hand, before you go out buying all sorts of stuff. You might surprise yourself! I guess you can tell I was quite relieved in finishing this journal. I had a lot of fun doing this tutorial, but boy, did I ever underestimate the amount of work that would be involved! So the final words of my Easy Peasy Journal speak for themselves. If you have a small but strong statement to make, try drawing your own letters and embellishing them. I did this in a very simple way by writing the letters with a white paint marker and then outlining them with a black pen. After that I added some lines across the letters for some more decoration. Of course there are much more elaborate and beautiful ways to embellish letters, but this is the Easy Peasy Journal, after all. Check out the resource section for books on lettering. Also check out websites on art journaling and other people's blogs. You can learn a lot from them just by looking. 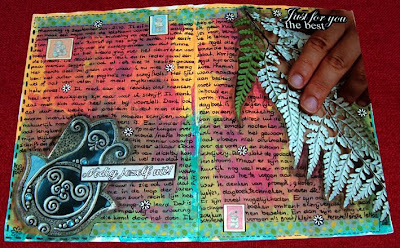 And here we come to the end of our three part art journaling tutorial. I hope you enjoyed it. It was fun, but also quite challenging to put it all together and it's always much more work than you expect it to be. Still, this blog is a work of love and as long as it stays that way I will try to keep pushing myself into new directions. If you have any suggestions for future tutorials I would love to hear from you. Until then I wish you lots of fun trying some of the techniques and ideas from the Easy Peasy Journal. Let me know how it goes! 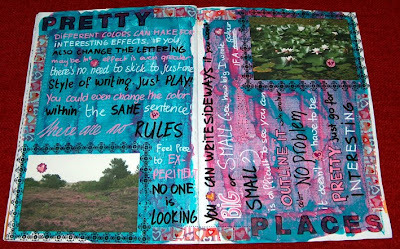 I am filling the spreads of the Easy Peasy Journal with different forms of writing. I so want to do a good tutorial on journal writing and I just don't have the time or energy this week. Both last weekend and coming weekend are filled with family visits on the main land and this Friday (the day to post the tutorial) I will be on the main land too for a doctor's appointment. This means I'll be away from home and studio for three days in a row and living where I live these are long days and long trips (think 5 hours long to get somewhere and 5 hours back the next day, if I'm lucky, last weekend it took me 7!). So I'm simply running out of time this week for the tutorial. I'm not one who handles things well when I have so little time to myself, especially when I get too little sleep like has been the case the past two weeks. I think there's a hermit in me who just can't stand being around people so much without having some time to breathe or just rest. I get cranky and whiny. It's not the people (they are wonderful), it's me! So I've decided to cut myself a little slack and instead of spending the coming two nights working like crazy to get this tutorial done before Friday, I will just give myself a little more time to finish it. 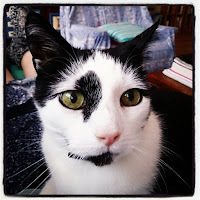 This means the third part of the art journaling tutorial will be delayed for at least a few days. I hope you understand. Now here's the other project that's kind of on hold right now. 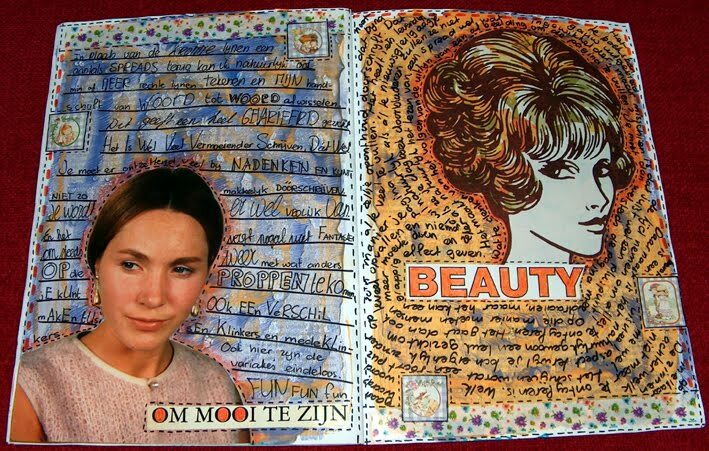 The butterfly book of questions. 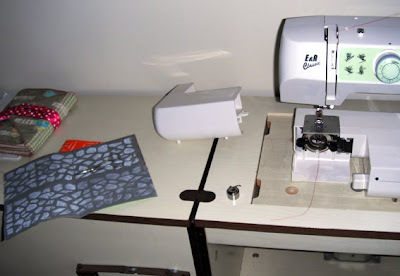 Here's how I left the sewing room last Wednesday (!). I'm working on the pages by sewing a zigzag border around them. I already finished two signatures and was working on the third when the bobbin ran out of thread. So I had to fill it up again first before I could continue, and it was really late already so I decided to go to bed instead. ;-) Since then I haven't been back to it yet, which goes to show how little time I've had, haha. Here's a close up of the page lying on top of the sewing table, so you can see what the edges of the pages will look like. In the meantime I'm still cutting out butterflies (see the first picture) and putting them in a bowl. They will be added to the pages too. Can't wait to see how it will look when it's done. But that won't be this week, that's for sure. For now I'm going to kick back and put my feet up and just do nothing for a while. Go to bed early for a change and catch up on sleep. I won't be blogging again until next week, so this is an early wish for a happy and creative week and weekend for all of you! I read this book in the spring of 2010 and enjoyed it very much. 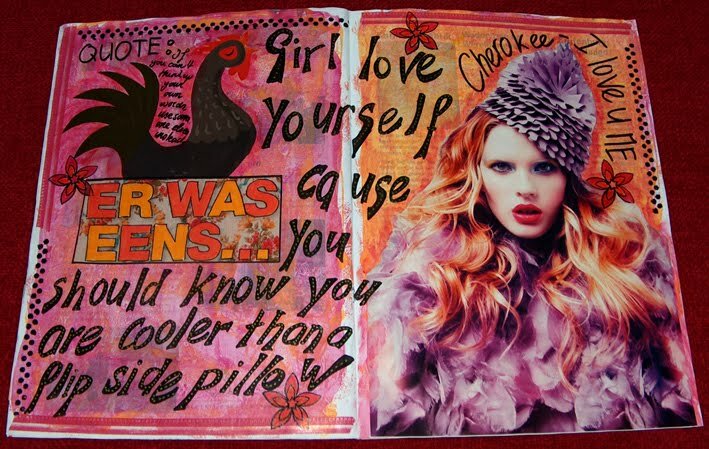 This book is inspiration overload. 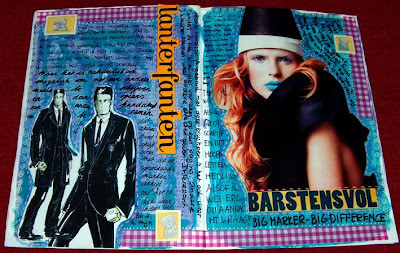 It's an introduction to many mixed media artists who share both their works and their techniques. The chapters are mostly written by the artists themselves. You get to know a little about the artists and why they work in a certain way and what thoughts and feelings got them to make what they are making. They explain the showed art, but they also give you a taste for trying it yourself by giving instructions on how you can go about a certain technique. There is eye candy galore, a literal exhibition with many different kinds of works, mixed with interviews and show and tell. There's a bit for everyone. If you are completely blank for ideas and don't know what to do next, you would have to be in a very big rut not to get at least one little spark of inpiration from this book. There's not much more to say about it really. This is a book to go back to every now and then, leaf through and get your creative juices flowing. Wonderful!